Review: 2013-03-09, the much anticipated fight between Bernard Hopkins and Tavoris Cloud was really disappointing and boring: it gets only one star! The 48-year-old Bernard Hopkins ranked as the No.1 light heavyweight in the world, entered the fight with a record of 52-6-2 while the undefeated Tavoris Cloud had a record of 24-0-0 (Cloud is not ranked as he hasn’t fought since February 18, 2012 when he defeated Gabriel Campillo by a controversial decision; but it was one of the best boxing fights of 2012). 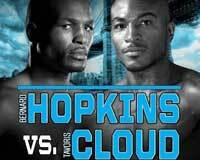 Hopkins vs Cloud is valid for the IBF light heavyweight title (Cloud’s fifth defense). Watch the video!